Lest you think I never share anything but bad news, journalist C.J. Janovy has written a new book about the battle for gay rights in Kansas, and it’s surprisingly encouraging. It’s full of stories of every day people who recognized that life could be good in Kansas for queer people and who went about, in a very hand-on-the-plow way, to make it happen. Over the long term, they won (even though we have to be on guard all the time to secure those wins for the future). Q: In the book, you illustrate acts and attitudes of common decency and acceptance — or at least tolerance — by ordinary people across Kansas. Do the state’s politics reflect its people? A: I think that’s a question that Kansans have been wrestling with for the last few years. There are a lot of people in my book who say “no.” The last couple of elections have been interesting, and we’ll see in the next cycle whether the representation changes as a result of Kansans realizing the stakes of not paying attention to what’s going on in Topeka. 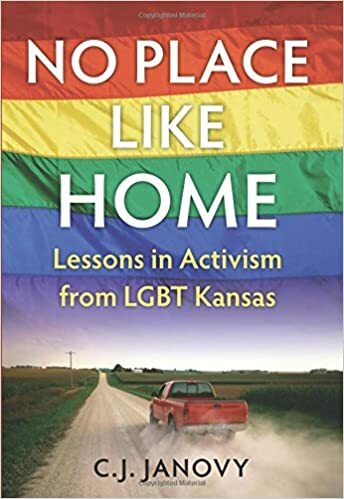 I hope some of our readers check it out and support Janovy’s work and LGBT activism in Kansas more broadly, including the work of younger activists who are beginning to carry the mantle of those profiled in No Place Like Home.